Motorcyclists have the same rights and responsibilities as any other motorist. However, most car and truck drivers fail to take the proper precautions and violate these rights. Often, other motorists fail to see motorcyclist despite the fact that motorcyclists wear bright colors and have engine noise at noticeable levels. These accidents are frequently the result of inattentive drivers that carelessly changes lanes or impact motorcyclists from the rear. Motorcyclists are also at greater risk from roadway defects that do not present a problem for other vehicles. When negligent roadway maintenance results in potholes and uneven roadway surfaces, motorcyclists face the risk of being thrown from their bike. Click here for more information on defective roadways. The danger of motorcyclists being thrown into traffic and suffering further injuries additional multiple impacts is extremely high. Even low speed accidents can result in serious or permanent injuries, including traumatic brain injuries, spinal cord injuries, paralysis, fractures, severe abrasions and scarring, and injuries to wrists, shoulders, knees and other joints. Sadly, police officers, insurance adjusters, witnesses and jury members often start with a bias against motorcyclists. Their first inclination in any motorcycle accident is to blame the motorcyclist. Therefore, it makes no sense to hire an attorney who does not know one motorcycle from another, or is still influenced by the general cultural bias against motorcyclists. In fact, even if you are partially at fault for the accident you are entitled to financial compensation. 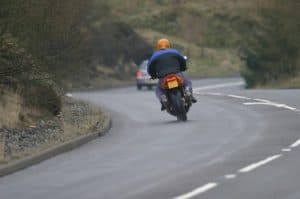 At ARDITO LAW FIRM, P.C., we understand the unique issues that an injured motorcyclist faces and what needs to be done to get maximum compensation for injuries, payment for medical bills, the repair or replacement of their bike, as well as the other financial and emotional hardships that lay ahead. If you or a loved one has been injured in a motorcycle accident, contact Ardito law firm, P.C. as soon as possible.